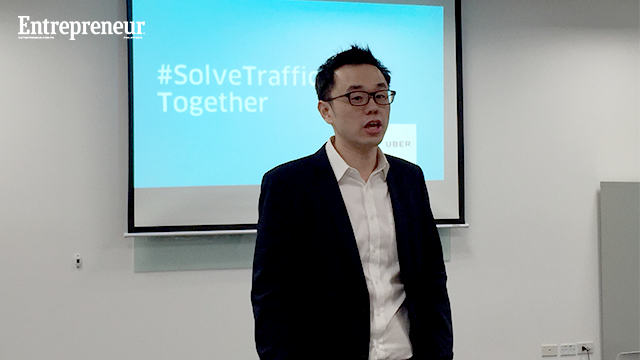 Uber Philippines general manager Laurence Cua called for a review on regulations for transport network vehicles (TNVS) permit application and processing in its bid to help solve the traffic crisis in Metro Manila. “Building trains and bus stations, these mass transport options are important but that will take time. The technology is here. Carpooling and ride-sharing are here. The solution that we are contributing and offering is something that will not require years,” Cua said in a press briefing on Wednesday, September 14. The ride-sharing application introduced a new service in June called Uberpool, which, as the name suggests, encourages carpooling for customers who are taking the same routes. 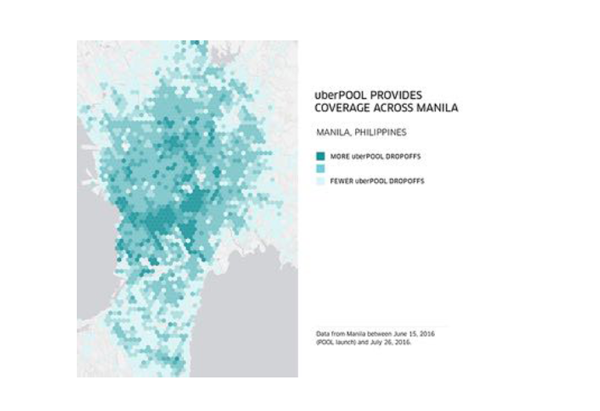 Uber Philippines said that as of September 1, 1.5 million kilometers of travel were saved thanks to the service, with 121,000 participating riders. This meant 175 metric tons of carbon dioxide emissions prevented, equivalent to 75,000 liters of fuel. An internal survey conducted by the app showed 79 percent of its users reduced or eliminated their usage of privately-owned cars. “We may have launched a promo for the service but what we saw is after trying it out, the users used the service again. It only shows that this works and Filipinos are open to it,” Cua said. However, in July 22, the Land Transportation Franchising and Regulatory Board (LTFRB) temporarily suspended the acceptance and processing of new applications for vehicles of ride-sharing apps or transportation network companies (TNCs) like Uber, citing backlog in the agency. TNVS applications reached 29,151 units in July, 80 percent of which were for Uber units at 23,292. This total is 800 percent higher from last year which was only at 3,500 units. Cua said the government has a “misperception” on Uber’s service and hopes the regulations may be reviewed. One regulation that Cua hopes to be reviewed is the number of requirements for a TNVS application. At present, an Uber driver aspirant will have to submit different sets of requirements to the company and to LTFRB. All these documents will then be collated by Uber, then submitted to the government agency. Cua said it takes an average of 100 days for the whole process to be completed. “Ideally, it shouldn’t take 100 days to get a car on the road. For someone who just wish to earn extra income, nakakaturn-off,” Cua said. The Uber Philippines general manager also hopes that cars to be used for the service will not be limited to “new” ones. Under the TNVS regulations, only three-year-old cars or newer, can only be eligible for the company. But Cua understands that the government was passing a “historic” regulation when it was implemented last year. “Some of the points [in the regulation] are something we can revisit if the ultimate goal is to use existing cars so we can have more ridesharing and carpooling happen,” Cua explained.